"All content has been temporarily removed from this site, pending an investigation into the theft of data from the Institute for Statecraft and its programme, the Integrity Initiative," the brief statement on II's website begins. Sputnik first reported on the existence of the disinformation operation after hacktivist group Anonymous published stolen documents from II on November 23 of last year. The hacks exposed how the shadowy "think tank" has meddled in the affairs of others nations, sought to damage relations between Moscow and its allies, smeared UK Labour party leader Jeremy Corbyn and other progressive politicians and misled parliament, Sputnik has reported. 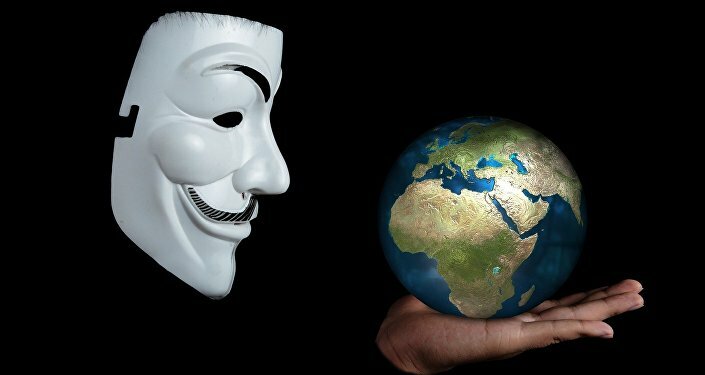 Anonymous claimed that Integrity Initiative received funding from groups including the US State Department, the offices of the NATO alliance and Facebook, and that its operations included covert structures capable of interfering in the domestic affairs of France, Germany, Italy, Greece, the Netherlands, Lithuania, Norway, Serbia, Spain and Montenegro. Radio Sputnik's Loud and Clear spoke with investigative journalist Kit Klarenberg about Integrity Initative's website coming down and what it really means in terms of disinformation campaigns. ​"It's highly ironic when a group, which claims to be dedicated to openness, locks its Twitter account and then tries to close down its website so that no one can access the content," Klarenberg said Monday. "Of course, most of it remains available via web archive — that's strictly hush-hush, though." "I guess this is a move borne out of desperation, because at first, when the first couple of document dumps occurred, they were desperately trying to frame this as a Russian cyber warfare operation that was designed to discredit them, and they kind of tried to raise doubts about the authenticity of some of the documents. When the dumps kept on coming, and the people kept on reporting on them, I guess they just resorted to completely removing their online footprint. Whether it will be reinstated any time soon, I don't know," the journalist said. However, Klarenberg cautioned that, "as shocking as the Integrity Initiative's activities are… the fact of the matter, is it's just one of many information warfare efforts which are run by NATO or by Western governments, particularly the US and the UK, which are designed to spread disinformation about Russia and any kind of political party or government or even individual they don't like. So even if the Integrity Initiative doesn't return, it's but one cog in a wider propaganda machine." Klarenberg noted that the public reaction to II's attempt to publicly own its practices as necessary to combat disinformation was hostile. However, he cautioned that "there's that old adage that ‘lies travel faster around the world than it takes for the truth to get out of bed.'" "That is one of the issues that we've seen — the media, but also some citizens, seem to have quite short memories on stuff like this," Klarenberg noted. "So they'll be fully cognizant of ‘Well, this thing happened,' but then when it's exposed, there's almost this assumption that ‘Well, these practices won't continue,' or ‘It's a thing of the past,' and probably then open the newspaper and read another negative article about Russia and don't really put two and two together and see it's probably highly distorted if not entirely dishonest." "In the UK, for 30 years there was a British Foreign Office operation called the Information Research Department, which was essentially set up to spread anti-Soviet propaganda around the world," Klarenberg told hosts John Kiriakou and Brian Becker. "But its activities extended to almost every part of the former British Empire and other parts of the world such as Indonesia. That was exposed by The Guardian newspaper in the late ‘70s and then subsequently wound down, but its operations were simply passed to new agencies." "There are a vast amount of film and television projects, particularly in the US, which would never have gotten off the ground if it wasn't for the CIA or the Department of Defense/Pentagon giving them financial and logistical backing. It's incumbent upon anyone who absorbs almost any form of media to wonder why certain information or individuals are being presented to you, and who benefits." "Russiagate in the US — and there are attempts to get it off the ground, the notion of ‘Russian interference' in the UK in respect to the Brexit referendum — is fantastic for the political establishment and elites… As many more sober observers called way in advance, Bernie Sanders has announced that he's running [for US president] in 2020, and suddenly everyone's coming out of the woodwork to call him ‘The Kremlin's Candidate' and that he's a tool of Russia and that he isn't hawkish enough on Russia and that he's probably being supported online by Russian bots, and all of these other things. It's a great way of, yeah, the political establishment the world over reinforcing their own power and discrediting or delegitimizing any movement or individual they don't like." "We see this with respect to the media at the moment, with this huge push about ‘fake news' and misinformation and online propaganda: you have this huge outgrowth in resources which are said to be fact-checkers or credibility-verifiers — stuff like PropOrNot, or Facebook's partnership with the Atlantic Council or this new initiative NewsGuard. Invariably, these resources are launched by organizations which are staffed by current and former national security establishment" people, Klarenberg noted.